Holiday 2012 round 2: Decorative sleighs and rustic lanterns, 25% off this weekend! 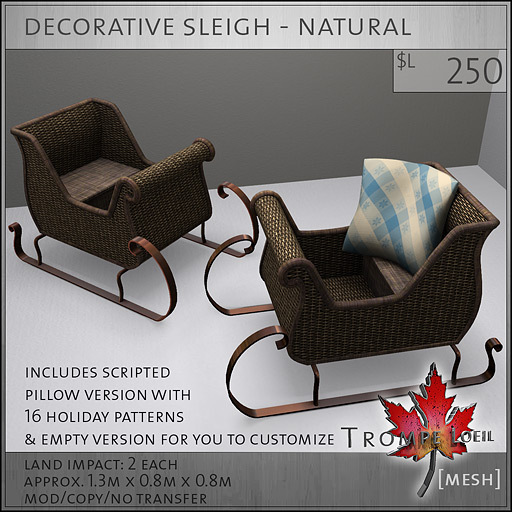 Just in time for the start of the holiday shopping season, round 2 of our Holiday 2012 offerings have arrived – and they’re 25% off this weekend only at the new Trompe Loeil Mainstore! 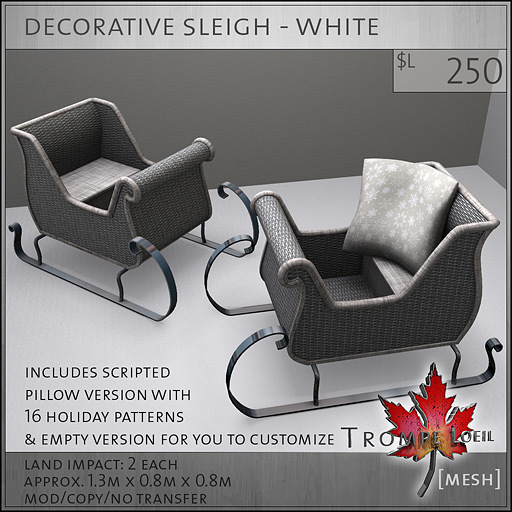 Our new Decorative Sleighs are only 2 prims each, and include two versions – one with a scripted pillow that includes 16 holiday fabrics via menu, and an empty one ready for your own unique customization. 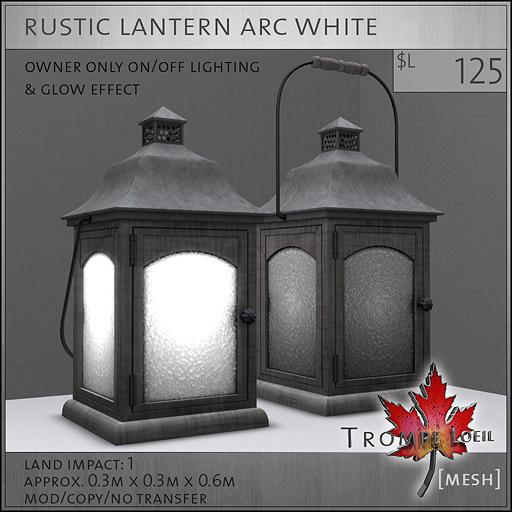 Pick from White or Natural – they’re both 25% off until Sunday midnight SLT! 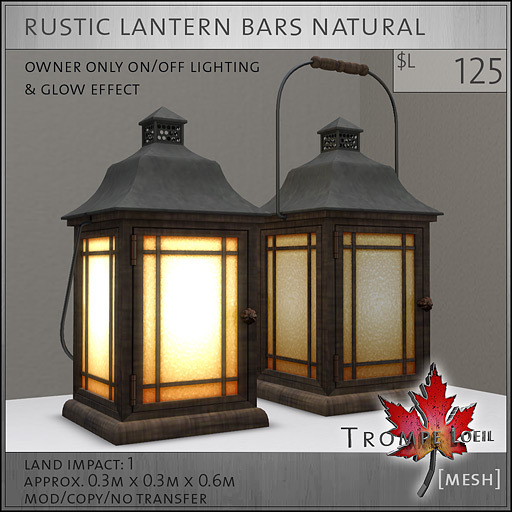 These new Rustic Lanterns work as a lovely decor accessory during the holidays or year-round! Owner-only touch turns the hardware lighting, full bright and glow on and off. Includes handle-up and handle-down versions, and they’re only 1 prim each! 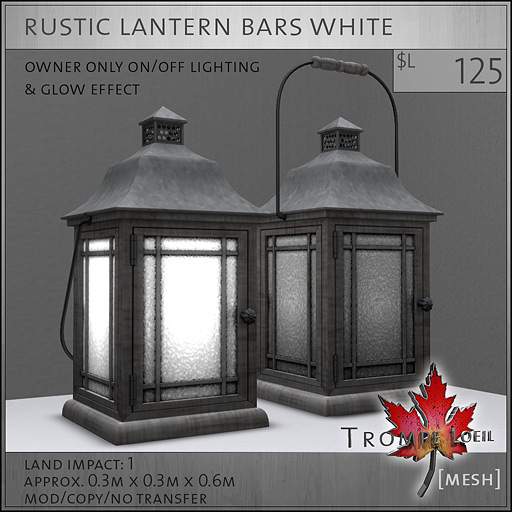 Available in White or Natural versions – grab them this weekend at the Trompe Loeil Mainstore for a 25% off discount!